Not sure if they count as bots or just other MST3K related props but... has anybody else ever made a nanite? I used to have one, he's floating around somewhere... probably hanging out with Gypsy and my theater bots up in my parents' attic. -The body is a vhs tape with the guts taken out. 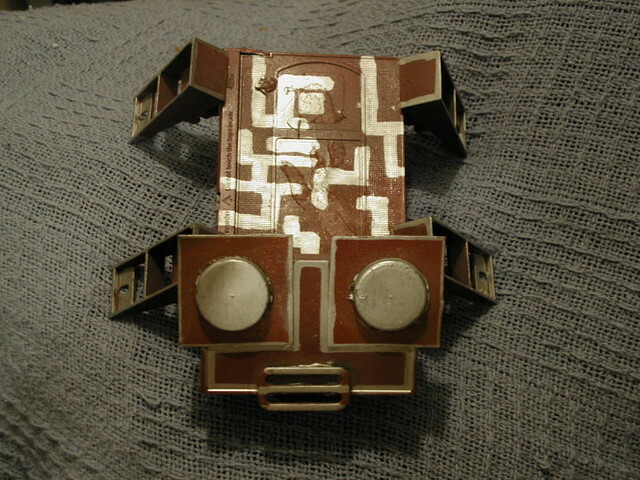 -The head is the case to a cassette tape, the eyes are film canister lids. -The legs are gutter clips (found in most hardware stores located in, you guessed it, the gutter section). -The squares that the film canister eyes are glued to are lids from those little cardboard boxes they put jewelry boxes in. -The mouth is a metal adjustable... uh... "thingy" is the only word I can think of... anyway it came from a duffle bag strap. He's painted purple, the same basic Krylon purple that I did my Gypsy base coat with. The little silver markings were drawn on with a Testors silver paint pen. Basically I just threw him together because I was bored and had all the parts (minus the gutter clips) just laying around. It was a fun little project, and very simple. He's for display, and his mouth doesn't move like on the show. Sweet! I was wondering how to make the eyes. Yeah, the Bot Building Guide says those gutter clips are also known as Fascia Fixers from Amerimax Home Products, Inc.
Haha, now I want to build one. XD I better get some VHS tapes before they follow the way of the Dodo...or the Infant Love Seat for that matter! Yep, that's them alright. Except the ones I found were originally brown. Lol! Yeah, it's a fun little project. Went over to Lowe's and couldn't find them for the life of me. I looked up and down that gutter isle for what seemed like a good 10 minutes. Hmmm. When I found them they were tucked away in a little bin on the bottom shelf of the gutter isle. If I remember correctly they were loose, i.e. not in a plastic wrap, and sold individually. The ones I found were originally brown, and not white like in the picture. This was a few years ago, so maybe they use something else for gutters now... honestly, I'm not even sure what they are used for, all I know is that it has something to do with gutters . Did you get the chance to ask someone? Maybe take a picture with you for a reference? I went to Lowe's one time to find a part for my bathroom sink and was convinced they didn't have it until my wife forced me to ask... it turned out that I had probably looked right at it several times . Amerimax does not sell direct. The sales person I spoke with was aware of MST3K, and was even a fan. There is an aluminum version (part number 85078) that SHOULD be available at Lowest or Home Depot. If they don't have any, have the sales associate call 800-347-2586 and special order it for you. Man, if tracking down the engine block would only be this easy! Interesting that they don't carry the plastic ones at Lowes or Home Depot anymore. The aluminum ones should work just fine since they get painted anyway, just hot glue 'em to the vhs and viola! My money says the aluminum ones are WAY thinner than the plastic ones. I'm going to order some and take some pics. I don't have the pix, but I bet he still does - Gary, care to chime in here?